All towns have religious processions on the evening of Good Friday . 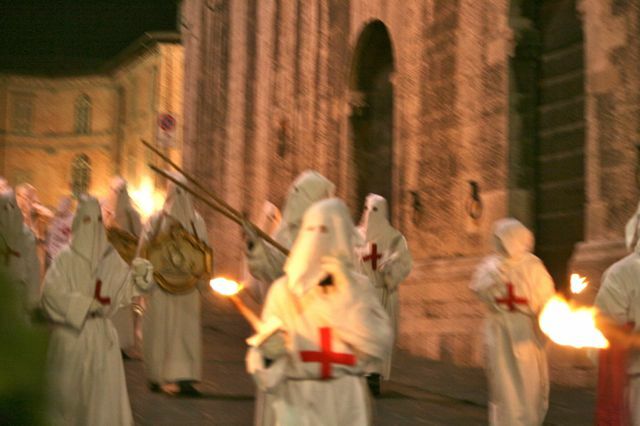 If you are staying in one of our villas near Mercatale di Cortona in the Niccone Valley, the villagers have a procession that culminates in the burning of a brushwood cross in the piazza – very impressive. 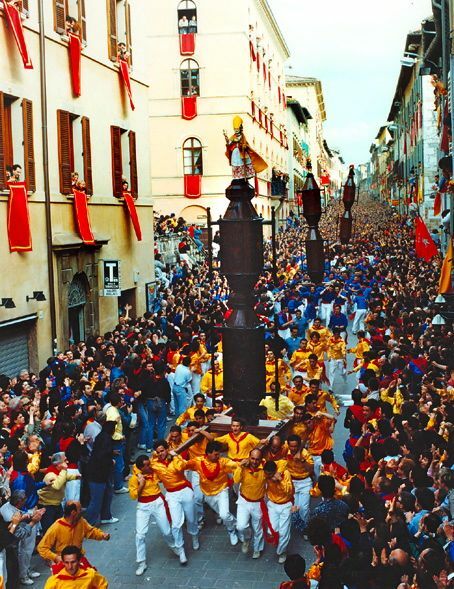 Florence and Orvieto have big events on Easter Sunday. Every May 15th the whole town comes out for an event shown on national television, the Corsa dei Ceri. After much parading around the town and religious blessing (not to mention drinking), relay teams race up the slope of Monte Ingino carrying giant wooden “candles” or ceri. The festival would appear to have its roots deep in Italy’s pagan past. Like many festivals in Tuscany and Umbria, this is undertaken in medieval costume. This is a crossbow tournament held twice a year between two towns, San Sepolcro and Gubbio. The tournament started in the 14th Century and, when it comes to this tournament, the towns are great rivals. The event takes place in Gubbio on the 25th May and Sansepolcro on the 7th September. Many towns hold this event on the festival of Corpus Domini (this varies depending on the date of Easter but it is in May or June). The pedestrian streets of the town centres are decorated with intricate designs made with fresh petals. The designs are started on the Saturday evening and are ready for the procession on Sunday when a procession lead by a priest walks over them. 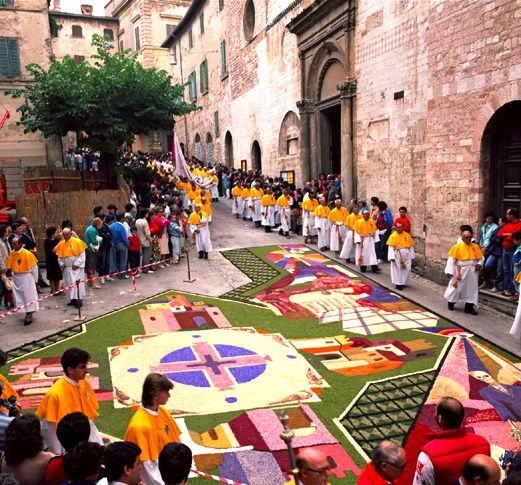 Spello in Umbria is probably the most famous infiorata. A week of classical concerts held in Magione (near the Lake), Perugia (nearby) and Gubbio (not really anywhere near the Lake). Concerts are ticket only and discounts are available for multiple bookings. Musicians, many belonging to the blues genre (although sometimes, soul, funk or rock) play gigs in the towns around Lake Trasimeno. Many concerts are free but some require a ticket. Vibrant and world class Jazz Festival increasing in popularity every year. In previous years James Brown and Miles Davis have been in the line-up, the headline acts are increasingly non-jazz, recently, REM, Simply Red and Mark Knopfler have played. For these 9-10 days the night time streets are thronged with people. It is a very exciting time to visit the city whether you have a ticket for a particular perfomance or not. There are many free events. For more than twenty years the medieval hilltop village of Preggio has held a festival. Including chamber music, choral, piano, organ and song recitals as well as a a highly recommended opera in August. Preggio sits high above the Niccone valley 15 minutes from Mercatale and 15 minutes from Umbertide. 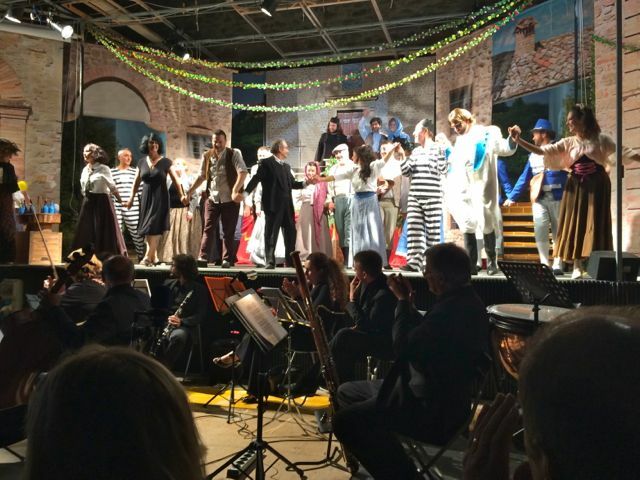 The opera, sung by professional singers when the big opera houses are closed and supported by an army of volunteers, is held in the garden of the church – a wonderful experience. Tickets sell out fast. Preggio holds a popular chestnut festival in the third weekend of October, people come from far away and the hilltop village operates a bus service from a car park below. 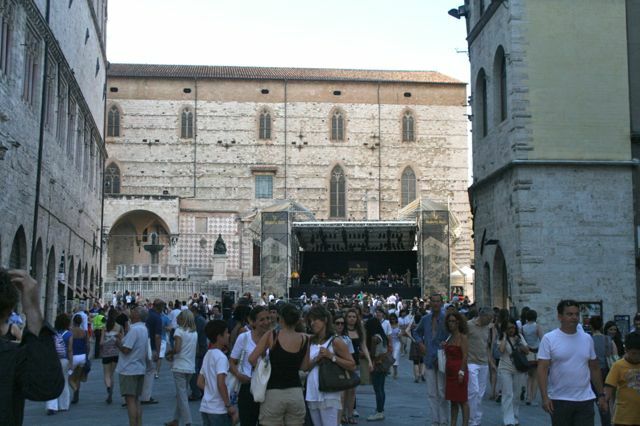 The Montone Film Festival is a very popular and successful film festival operating for a few days every July, there is usually a clash with the start of this festival and Umbria Jazz. The setting is the small but beautiful medieval hilltop town of Montone. Many films are shown in the town’s atmospheric piazza. The festival is a week of screenings, workshops and forums. It is attended by directors and actors including in previous years Colin Firth, Terry Gillam and Ralph Fiennes. A celebration of truffles, funghi and other local foods and wine as well as local crafts. Get there early (i.e. before 4pm) if you want to park nearby. Palio delle Barche, Passignano – (late July). On the face of it a most pointless race between the “quartieri” of the resort town by Lake Trasimeno. Teams of men in a kind of medievel costume, race into the lake in rowing boats, around a marker and then back to land where they pick up the boats and run to the top of the town. You have to see how Passignano is built into a formidable hillside to appreciate the effort involved. Then follows the main activity – carousing late into the night with lots of fireworks. Great fun but crowded. The majority of villages in this area hold annual summer festivals of varying sizes. In mid July Lisciano Niccone has a Sagra dei Bringoli that runs over two weekends. A sagra is a festival with a food related theme, in this case, bringoli, a thick hand rolled pasta. 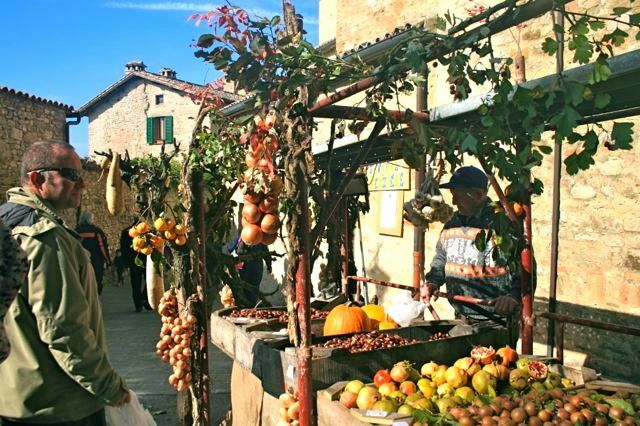 The neighboring Tuscan village of Mercatale di Cortona holds a festa in the second week of August, generally a week long with cene (dinners) cooked and eaten in the village square every night. Dancing, small theatrical shows and dance troupes entertain the crowds. The festa’s high point is on Ferragosto the national bank holiday on the 15th of August, when the midnight firework display gives a noisy close to the night. 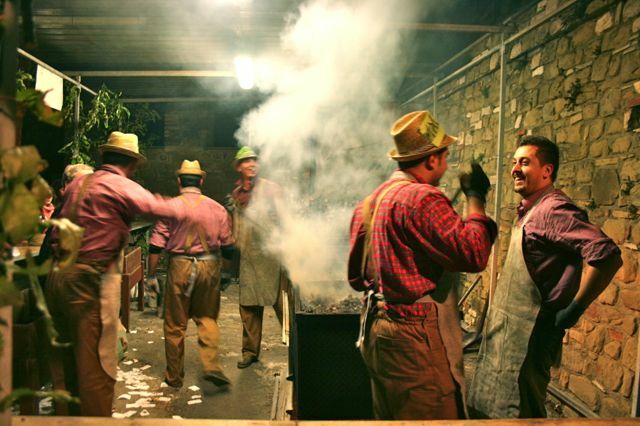 Located close to many of our villas, the town of Umbertide holds a festival of the 1800’s. Many people dress up in period costume, temporary tavernas pop up in cellars and parts of the town are run by brigands, Garabaldi’s red shirts and patrolled by a “regular” 19th Century army. Great fun with lots of loud bangs. (August 16th annually- also in July). 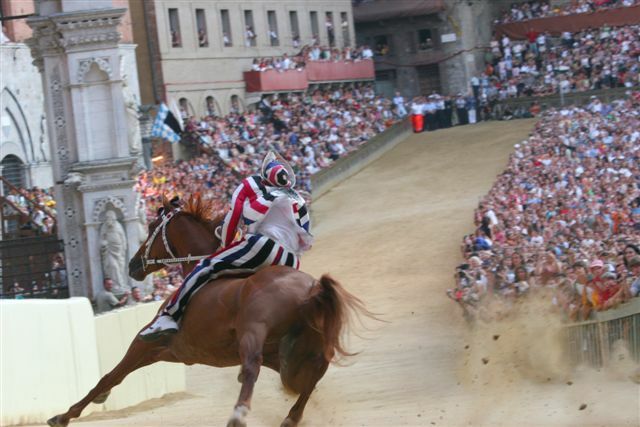 The famous Siena Palio, a mad horse race around the scallop shell shaped piazza, the Campo and other medieval fun and games. Lots of people want to see it but without a room with balcony overlooking the square or at least a booked seat it can be a hot and exhausting day.